Members of the Native American tribes that once came together to petition for the creation of Bears Ears National Monument gathered near the site Sunday to share stories about their connections to the sprawling landscape that the Trump administration recently stripped of certain federal protections. Named after a pair of buttes, Bears Ears is home to thousands of Native American archeological and cultural sites and is considered sacred to many tribes. Tribal elders and other members of the Navajo Nation, Hopi, Zuni, and Ute Mountain Ute tribes made it clear at the gathering that they are focused on ensuring the area is given the protections they believe it deserves: nothing less than the 1.35 million acres set aside by President Barack Obama in 2016. Malcolm Lehi, a member of the Ute Mountain Ute tribe who lives near White Mesa, said energy is building in indigenous communities, and lawmakers and government officials can’t turn a blind eye. In December, on the recommendation of Interior Secretary Ryan Zinke, President Donald Trump reduced Bears Ears by 85 percent, cutting it to 201,876 acres, and divided it into two disconnected areas. The Bears Ears Inter-Tribal Coalition, the group of tribes that petitioned for monument status, condemned the move — which opened the door for new mining claims — and filed a legal challenge. That Trump decided to gut Bears Ears came as no surprise, given comments he and Zinke made early in their review of the area. The last few months have only further confirmed critics’ fears about the administration’s motives. Uranium mining company Energy Fuels Resources, a U.S. subsidiary of a Canadian firm, lobbied the administration to dramatically reduce the monument’s size, the Washington Post reported in December. And the New York Times obtained emails via a public records request that show potential future oil extraction played a central role in the decision. 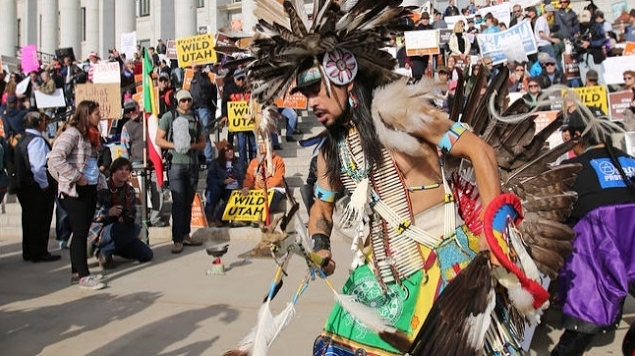 The storytelling event on Sunday was organized by Utah Diné Bikéyah, a nonprofit organization working to safeguard Bears Ears and other ancestral lands, and came a little more than a week ahead of public scoping meetings that the Bureau of Land Management is hosting as it plans for how to manage the new, smaller monument. 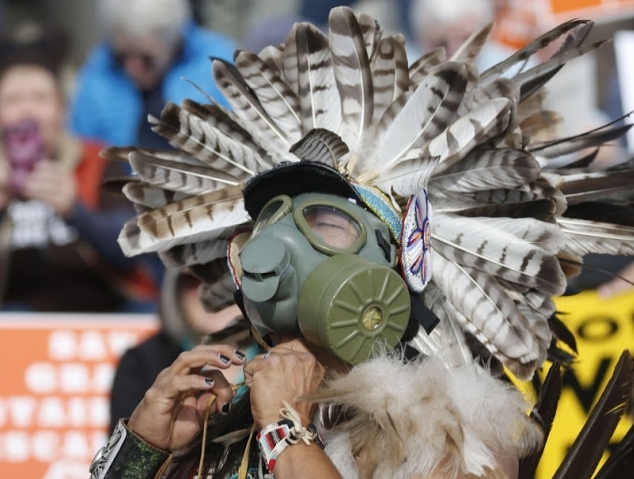 Tara Benally, of the Navajo Nation, said Bears Ears has sustained her people for generations, and that they still use the area for religious ceremonies and to collect food and traditional medicinal plants. “Losing Bears Ears to a cloud of industrial smoke from extraction and mining does not keep that preservation of life for us,” she said. Clark Tenakhongva, an artist and the vice chairman of the Hopi Tribe, echoed that message. 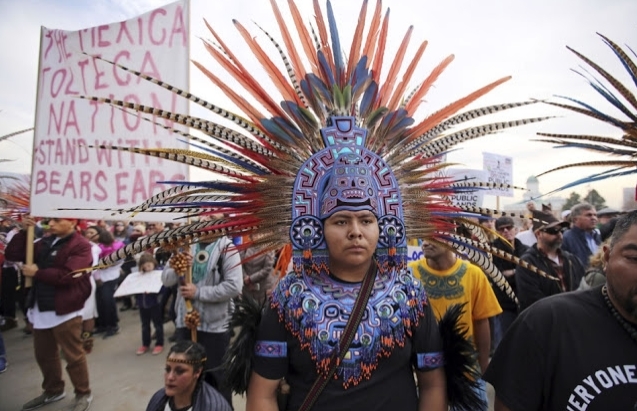 The Hopi, he said, believe they were the first to occupy this area and feel a responsibility to protect it. The tribes say they were ignored throughout the administration’s months-long review — a claim the Interior Department has dismissed. Zinke did meet with representatives of the tribal coalition last year, but for just one hour. He also toured Bears Ears with several monument opponents, including Utah’s Republican Governor Gary Herbert and commissioners of San Juan County, where the monument is located. Zinke sparred with Arizona’s Democratic Representative Ruben Gallego on this topic during a congressional budget hearing last week. Gallego, who has introduced legislation that would protect the monument’s original boundary, asked the former Montana congressman about how many times he had met with industry representatives versus coalition members. Zinke said “all sides were represented” in his recommendation to Trump. Gallego toured Bears Ears over the weekend and ended his visit with a stop at Utah Diné Bikéyah’s event. He told HuffPost that meeting with tribal members and hearing stories about their connections to the area only reinforced for him that the area is worth preserving. 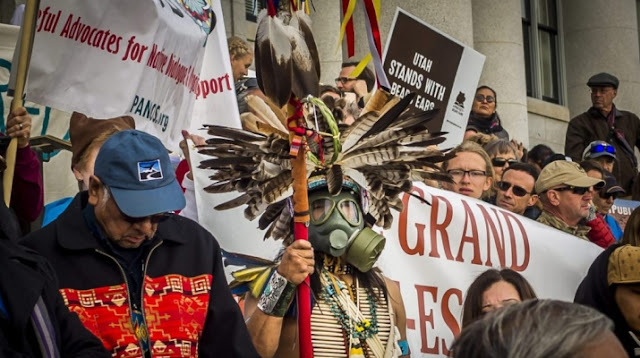 Shrinking the monument is an attack on the United States’ public lands and is “stripping parts of, I would say, people’s souls, because the Native American population here is so connected with that,” he said. Gallego added that he expects “a monumental fight” — one he sees the Trump administration ultimately losing, whether in court or via congressional action. Responses to "Native American tribes come together to protect Bears Ears from Zinke"